Want Siri on your non-iPhone 4S device? Take a look at these alternatives in the App Store. Siri is amazing! Because Siri was created by Apple, it has full access to the iOS. This means it can do really powerful things like creating new reminders or sending out emails to contacts. Siri is also capable of carrying seemingly natural conversations with you. If you don’t have an iPhone 4S yet, there are a few iPhone and iPod touch apps popping out in the App Store to serve as alternatives for the time being. These apps try to duplicate and or imitate the features of the native Siri app on the iPhone 4S, although none of them come even close to being as effective. We’ve reviewed the 6 top voice recognition apps in the App Store that offer assistant like functionality, including SpeakToIt Assistant, Evi, Dragon Go, Vlingo, Voice Actions, and vokul. We tested all of the apps using the same 12 commands listed below. You can see the overall results in the table below. While not any of the apps can do what Siri does, some of them offer interesting and unique features that may be of interest to you. Read below for the highlights of each application. Jailbreak Alternatives for Siri: If you have a jailbroken iPhone with Cydia installed, you can get a hacked Siri working on your device using either the i4Siri or Sara Cydia apps. These jailbreaks will also allow you to do things using Siri that it can not do at this time like launch apps, translate text, send tweets and more. Speaktoit Assistant is an avatar based customizable assistant. Pros: Free, Carry on a basic conversation. Configurable Avatars. Performs Basic actions like SMS, email, phone, and music. Search for info inline using Google. Cons: Horrible timing issues and lots of trouble with misunderstanding voice commands. Locks up Crashes randomly. Uses Evernote instead of native Reminders app. Search results loaded in tiny Google frame. Map search is broken. Evi is the assistant app with one eye. Pros: Free, Understands speech very well without many mistakes or errors. Finds books, music, concerts, business listings, recipes and more. Cons: Did poor in our 12 step test especially performing native iOS tasks. Dragon Go! uses voice commands to search and return results using a variety of websites and apps. Pros: Free. Understands very well, never had any issues with misinterpreted words. Uses context of commands and matching web service to return relevant results. For example, If just say Lakers, it will do a web search on ESPN, or if you say Natalie Portman, the app will search for movies on Netflix and iTunes. Web searches using various search engines like Bing, Google, Wikipedia, etc. Can search for and play music or movies on installed iPhone apps like Spotify, Netflix, and Pandora. Find restaurants using Yelp and reservations via Opentable. Cons: Can not perform any native iPhone tasks. No audio response. Vlingo has a simple interface and good speech recognition. It can index your contacts if you allow it to for improved recognition. Pros: Free, Understands very well. Can make calls, send email, and SMS contacts. Displays local search results come from CitySearch. Can update Twitter and Facebook status if you log in and authorize the app, although not using native apps. Learns and adapts to your speaking style over time. Cons: No voice response, No support for reminders, calendars, notes, and other native tasks. Can’t do a web search. Voice Actions has a minimal interface and is the only app that can create events. Pros: Performs basic iPhone actions like call, email, SMS, and even Calendar. After first tap, the mic stays on so you can send commands without touching the iPhone. Can create events on your Calendar app although it also stores them internally and will prompt you via Notification Center. Weather command for today or tomorrow returns a spoken response. Cons: Not Free, Plain user interface (just a black screen), a few awkward timing issues since you have to wait a bit too long before you can speak commands. Records in the background the background the entire time you’re using it. If you ask to setup an alarm, it creates a calendar event instead. Reminders and Notes commands do a search on Amazon (very strange ). If you ask the app to “Search the web for iPhone News” it will read you the news headline of a seemingly random story, no links. vokul uses a customizable wakeup command and can perform basic phone and music operations. Pros: When the app starts it initializes by updating data from your media library and contacts. Sending an SMS message loads up a proprietary screen where you can talk and dictate your text. Cons: Not Free, Bad speech detection, Errors saying “didn’t get that” a few times in a row, and the “try again” doesn’t fix the issue. Calling and Texting is not fully hands free, since it requires you to touch the screen when vokul finds the results from your Contacts. Asking vokul to create a note to buy milk, ends up playing a song by Queens of the Stone Age, very funny. Oh and the song never actually plays. 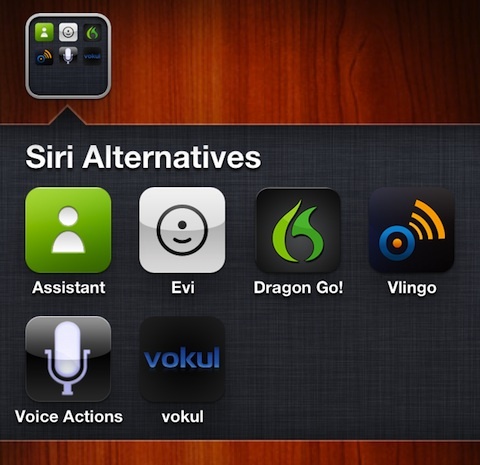 AppSafari review of Alternative Apps to Siri for iPhone and iPod touch was written by Joe Seifi on February 16th, 2012 and categorized under App List, Productivity, Utilities. Page viewed 8278 times, 2 so far today. Need help on using these apps? Please read the Help Page. Great information to know. Seems as though I remain a bit confused as the rate of changes in his industry are constant and quick!